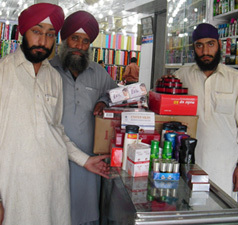 Peshawar, Pakistan: UNITED SIKHS, since February has provided financial assistance to rehabilitate 13 families who had to flee from their homes in the North West Frontier Province of Pakistan due to threats from the Taliban and communal conflict. The rehabilitation programme for Internally Displaced Persons (IDP) was funded mainly by donors from Bangkok, UK, Canada and USA, who responded to an appeal for help from UNITED SIKHS. Last year we rehabilitated 11 families from the North West Frontier Province, bringing the total to 24. Under the programme, we helped the families to set up small shops in Peshawar, Hassan Abdal, Rawalpindi and Nankana Sahib as a source of income which they badly needed after they fled from the Taliban in the (Feroz khel tribe) Orakzai Agency and and communal conflict in the (Sada) Khurram Agency. “We the Sangat in Bangkok were deeply distressed when we were shown the plight of minorities in Pakistan. If we do not reach out to them in such dire conditions, who do we expect will do so. We sincerely hope that our brothers and sisters from all corners support and inspire each other to support each other, whenever the need arises." said Pinderpal Singh, a Bangkok Sikh community representative. “More families are in need of relocation and rehabilitation. 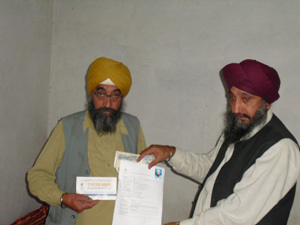 After the Taliban beheaded Jaspal Singh on abducting him in the Khyber Agency with Surjeet Singh and Gurvinder Singh in February, Sikh families of the Khyber agency live in severe tension and fear for their safety,” said Mejindarpal Kaur, UNITED SIKHS Director who highlighted the needs of the Pakistan IDPs to the Bangkok Sikh community in February. “There are about 40 Sikh families in the Khyber Agency who need to be relocated to safer areas of Peshawar or Nankana Sahib as their lives are in danger," she added. Each family needs $1000 USD to relocate and start a new life in a safer area. UNITED SIKHS also donated some books and Kakaars (Sikh articles of faith) to Guru Angad Div Ji Khalsa Dharmic School and to Bhai Joga Singh Khalsa Dharmic School, both in Peshawar. Master Ravinder Singh Ji and Master Charanjit Singh thanked UNITED SIKHS for the donation. The displacement crisis in north-west Pakistan is not over. In addition to those who fled last May some 1.3 million people from the Federally Administered Tribal Areas remain displaced in various parts of Khyber Pakhtunkhwa , the new name of North West Frontier Province(NWFP). They fled homes in Bajaur, Mohmand, South Waziristan, Khyber, Kurram and Orakzai in various waves as security forces launched operations against militants in the tribal belt. Many of those from Bajaur have lived in camps for more than 18 months, while those from Orakzai and Khurram have fled more recently. People are still fleeing the conflict areas. In April end, some 85,000 displaced people from Kurram and Orakzai have taken shelter in Hangu, Kohat, and in Peshawar.